My GYN suggested that I try these to get a bit more calcium, I was skeptacle that they would not taste good. What a great surprise that they taste good and the texture is great! 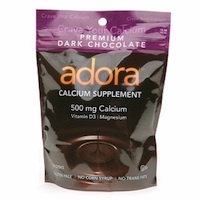 This product gives you 500mg of calcium plus vitamin D3 and Magnesium all in the form of a chocolate. It comes in milk and dark chocolate and it's delicious. It is gluten free, and contains no corn syrup or trans fats. Each disk has 30 calories and 2g of fat. It's a great way to get your calcium and satisfy your chocolate craving at the same time.